Mespil Road, Dublin 4, Ireland. Mespil Hotel is a modern three star hotel located within Georgian Dublin an elegant and stylish part of Dublin city centre and just minutes walk from Stephens Green. The Mespil is situated at Baggot Street Bridge, overlooking the banks of the Grand Canal and within close proximity to St Stephens Green, Grafton Street, Ballsbridge and the RDS. The Mespil Hotel is a quality city centre hotel offering modern, spacious accommodation in relaxing surroundings. Whether you are travelling to Dublin for a business meeting, shopping spree, relaxing break or simply to discover Ireland’s capital city a warm and friendly welcome awaits you at the Mespil Hotel. 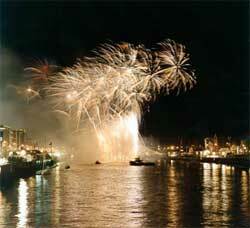 Dublin, Ireland's capital city is steeped in history and buzzing with youthful energy. Medieval, Georgian and modern architecture provide a backdrop to a friendly, bustling city where the cosmopolitan and charming converge in delightful diversity. 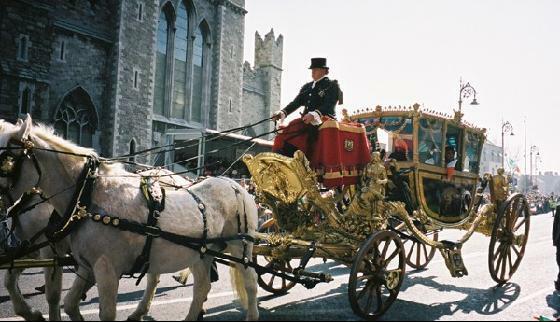 Stroll through the streets of this wonderful city and you may still hear echoes of the generations of famous personalities that called Dublin home. 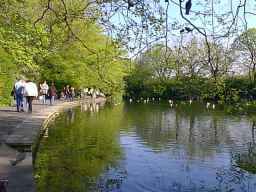 St.Stephen's Green is a 27 acre park in the heart of Dublin city centre. A popular lunchtime retreat for many of the office workers in the area, it was originally open public ground until 1663 when the Corporation fenced the area off. The green was then sold and the ground was closed to the public. It was during this time that the Georgian houses around the Green were built. The Green remained private ground until 1877 when Sir A.E. Guinness, a member of the Guinness brewing family, pushed an act through Parliament making the Green open to the public once again. 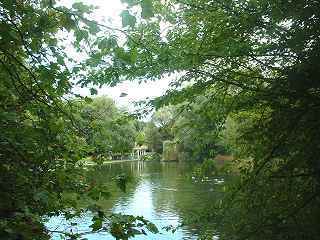 He later paid for the laying out of the Green including the gardens and the ponds which date from 1880. The park has many statues including memorials to Yeats and also to James Joyce. Also present are the Three Fates, a group of bronze female figures watching over man's destiny. The Green today is very popular, particularly during the summer, to go and spend time watching the passing crowds or just spending time in the sunshine. The gates of the Green are open according to daylight hours. On St. Patrick's Day the world is Irish! 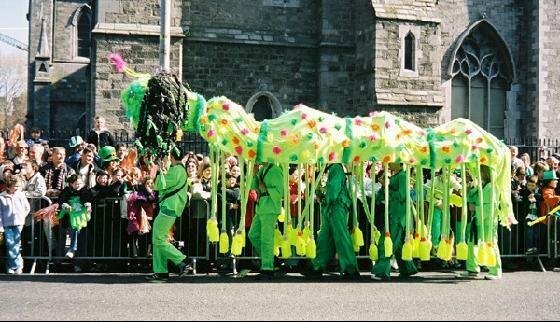 What better place to have been than Dublin for the best parade in the world. For an hour and a half hundereds of thousands of people were entertained by a fantastic array of colourful and creative pageants, marching bands, pomp, ceremony and celebration. 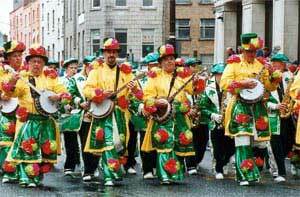 The parade started at 12pm from St Patrick St. It followed a route through Dublin's finest streets - Patrick Street, Dame Street, Westmoreland Street and O'Connell Street. This year's parade was an incredible spectacle with an 80% increase in performers, from 1,970 last year to 3,500 this year. 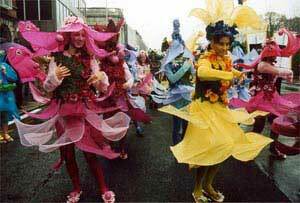 The theme of Voyages and Visions was the inspiration for a host of talented street theatre groups and bands who took part. 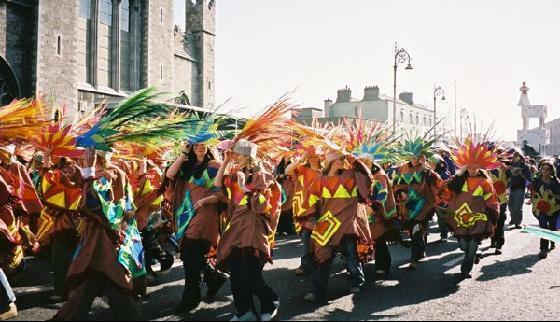 With bigger presentations from top street theatre groups such as Bui Bolg and Inishowen Carnival Group joined by new companies from Cork, Omagh and Kildare; as well as collaborations with Fatima Mansions, Emmet 200 and a new cross border initiative, this year’s parade was truly a nationwide event. Dublin, the capital of Ireland, situated in the east of the country, offers the same facilities as any big European city while still maintaining the most traditional and vibrant of Irish culture. Dublin has attractions to suit anyones fancy, from museums to shopping, from castles to sport centres, from churches to restaurants, and of course a very special and exciting night life with pubs, cafés and night clubs. Getting bored in Dublin city is just not possible. Dublin has some wonderful parts to explore, like the River Liffey that cuts the city in two parts or Grafton street, the cities shopping heart, and of course the famous O’Connor’s street. The home of Oscar Wilde, this city will prove a thrilling expirience for anyone, surrounded by music and the hospitality of the Dubliners. 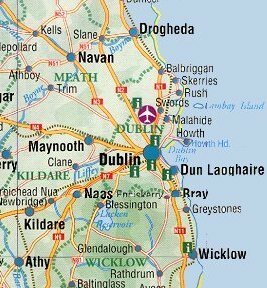 dublinsfaircity.com will inform you of everything you can see and do in Dublin, as well as providing you with listings of bed & breakfasts, guesthouse accommodation, self catering accommodation and hotels in the Dublin area.